Welcome to the Daddy Diaper Pack Giveaway! We're past diaper pack time in this house but this looks much better than what I had to use when I needed one. Here's a chance for you to win one for yourself. 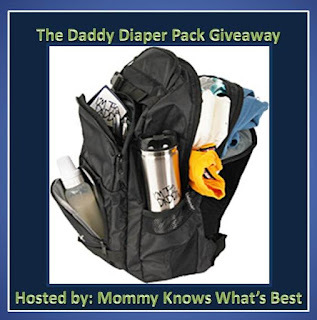 Read this great review of the Daddy Diaper Pack from Mommy Knows What's Best here! If you're looking for a great item to add to your list of expectant father gifts, check out the Daddy Diaper Pack. It retails for about $69.95 and can be found on the Daddy Scrubs website here. While there, you can check out their other awesome gifts for new dads! **Just for you: For a 10% discount from DaddyScrubs, enter the code BLOG13. Want to win one? Enter via the form below! Good luck! Giveaway begins on March 15th 1:00 am EST and ends on March 31st at 11:59 pm EST. Open to U.S. residents 18+ only. Winner will be chosen at random by Giveaway Tools, and entry will be verified. Winner will be notified by email and on Mommy Knows What's Best, and will have 48 hours to respond. If the winner does not respond, a new winner will be chosen at random and notified. Prize will be shipped from DaddyScrubs. Neither Java John Z's nor Mommy Knows What's Best is responsible for prize shipment. This event is not sponsored, endorsed or affiliated with Facebook, Twitter, Pinterest, or any other social media sites. I like the Daddyscrubs Classic in Edgy Navy! I like the All American Daddy Hat.